After 4958 miles, we pulled into San Pedro, CA. 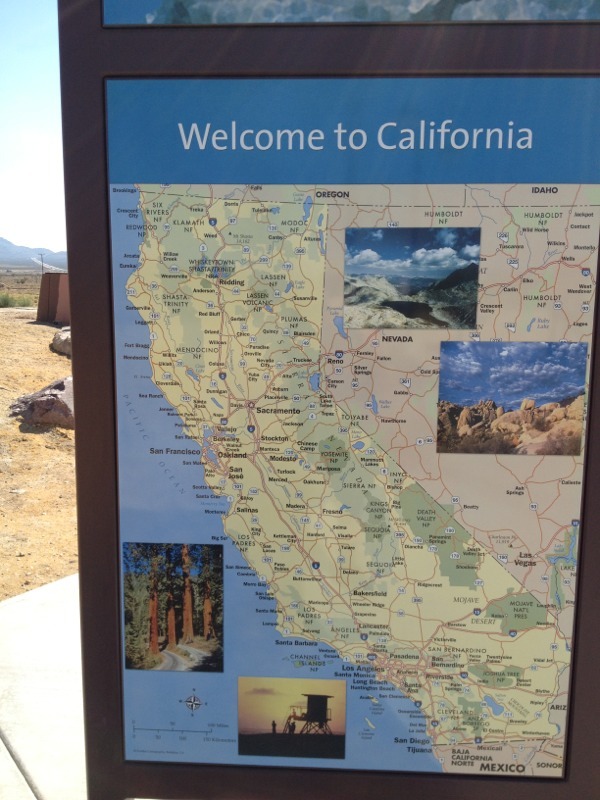 We left Jean NV about 9AM, stopped at rest area just across the CA-NV border. 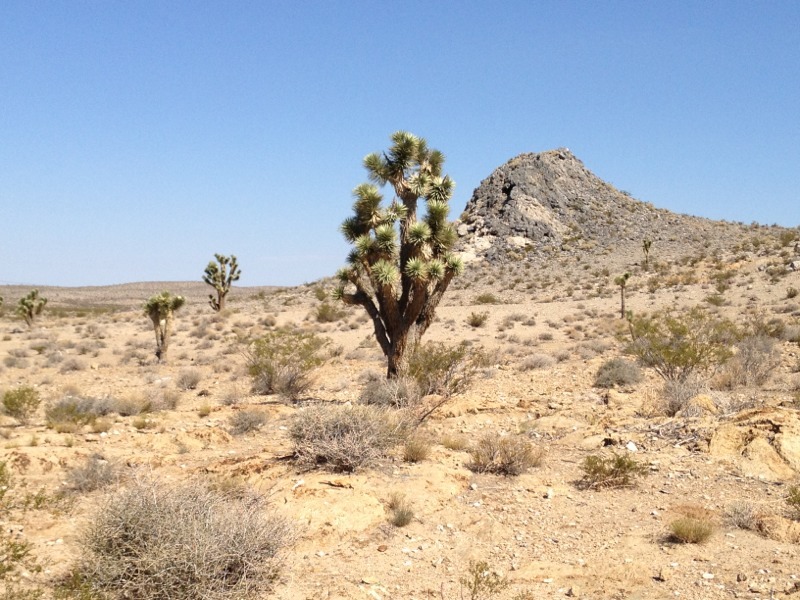 Took a few pictures of the desert and the joshua trees. Weather starts out hot in the morning and gets hotter. We talked with an older woman who worked in the dining room of the hotel. She had noticed my iPad. She said that she had a Kindle-Fire. She told us that when she was done with her shift she would go out in the desert and search for a geo-cache, but only if it didn’t get too hot. Too hot would be if it got over 105. 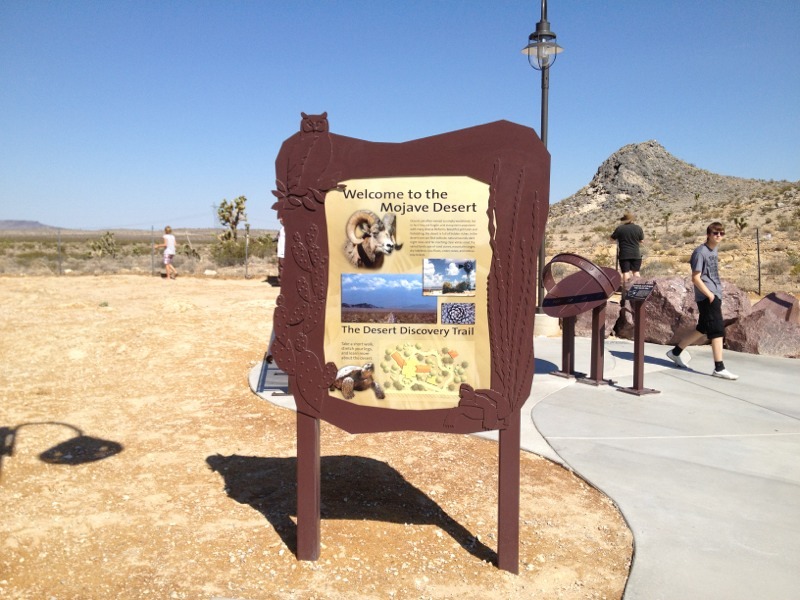 Here are a pictures from the rest area at Valley Wells, CA (aka. the middle of nowhere). We stopped in Victorville for lunch at a Coco’s. For you easterners, Coco’s a restaurant franchise mostly in CA. Much like IHOP or Denny’s. We finally hit the rush hour traffic of the I10 and I110. Nothing like the adrenaline rush of driving in LA traffic on freeways with 5 or 6 lanes across at 65 mph. One must keep your eyes on all three mirrors, GPS, and road ahead. We spent the next couple of hours partially unloading the Jeep. Then finally dinner at Nico’s Pizzeria in San Pedro with Mike, Theresa and Jonathan. Wednesday more unloading and dealing with keys and garage door openers. I’ll write another whole post on hotels. A couple more things to write. The drive south takes us through the NW corner of Arizona for about 20-25 miles. This has to be one the most beautiful sections of interstate highway. I don’t have any pictures because no place to stop safely. The section of roadway winds through multiple S curves through massive red canyons. There are signs “Watch for Rocks”. Of course, what they mean is watch for rocks on the roadway. As we get into Nevada, we are descending from the high plateaus of Utah. At Salt Lake city we start at about 4000′ ASL. Eventually we get to about 6000′ ASL. But when we get to Nevada we get down to about 1500-2000′ ASL. One first notice by change in pressure on your ears. Then you notice that by gum it’s getting a bit hotter. Once we were in Nevada, the outside temp was about 103. We stopped for gas at a truck stop. Damn that’s hot. Don’t tell me it’s dry heat. hot is hot. Like stepping into an oven. The section of highway in NV north of Vegas is one of the most desolate landscapes I’ve ever seen. On Tuesday, we will be driving through parts of the Mojave Desert, then into Barstow then San Bernardino. Interesting factoid about Barstow. FAA’s Los Angeles Center (The enroute center if you will) is located in Barstow. LA Center was one of the first Air Traffic control facilities built back in the 60’s. It was built in Barstow, because of fears of nuclear war. FAA figured that Barstow was far enough away from ground zero. At any rate, today we are off to LA. BTW, this blog will continue once we get to LA. Running a little behind. On Sunday, we joined Neil and his family at the Shadow Mountain Church in West Jordan, UT. I will post a separate post on SMC. After church, we headed up Emigration Canyon to have brunch at Ruth’s Diner. Ruth’s Diner is another restaurant featured on “Diners, Dives and Drive-ins”. Neil already knew about the place, so I didn’t need my iPhone app. I had a western omelet. 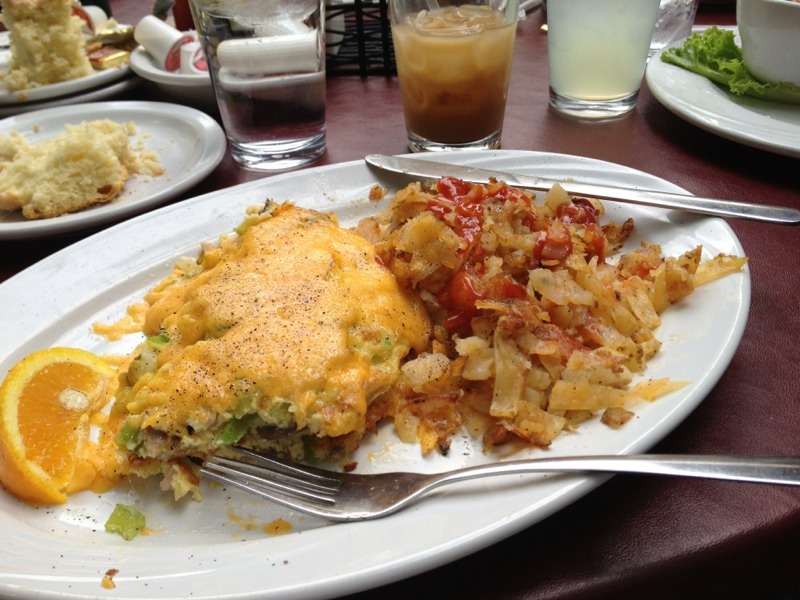 For east coast folks, see Denver omelet. Same thing. They have biscuits that are called “Mile high biscuits”. Outstanding. We had a table outside under a tree. Paula said it was brunchier to be outside. 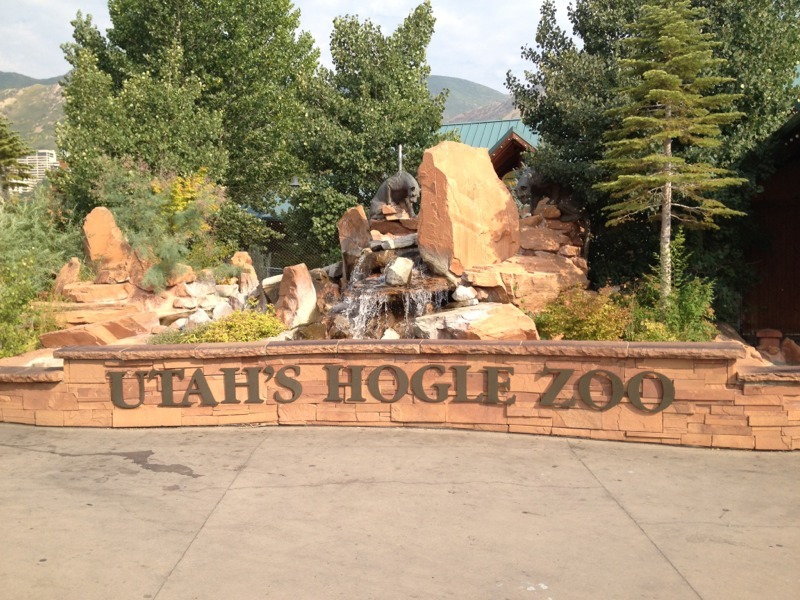 Next we went to the Hogle SLC zoo, just down the road. 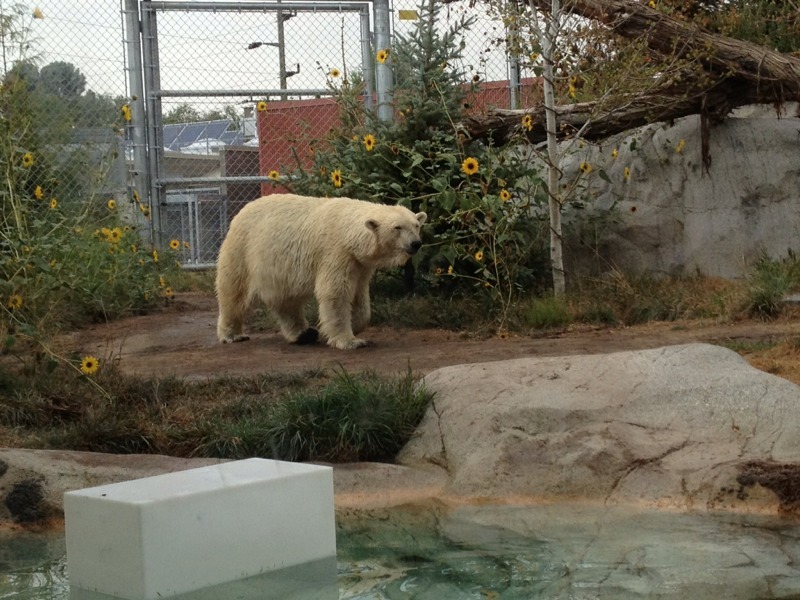 The boys liked the zoo which surprised us. 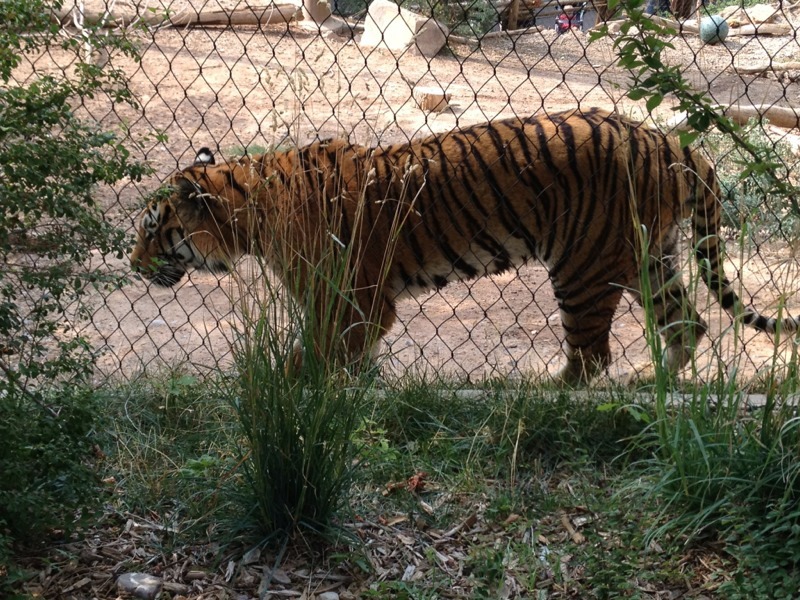 It was close to closing and I think some of the animals knew it. It seems that many of them had called it a day. Then we headed back down the canyon and had dinner with everyone. As always, beast (Neil’s boxer) was happy to see us. Off to Nevada on Monday. Getting close to the end of the trail. Did about another 400 miles today heading down I15 to Nevada. Once we got outside of Salt Lake the air got a lot cleared. We could actually see the mountains on the horizon. 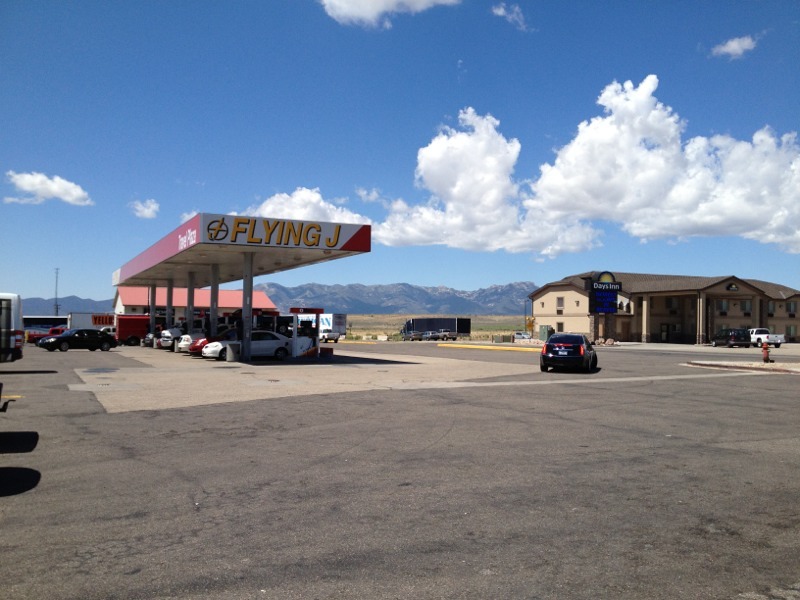 Here is a picture taken at lunch time at a rest stop somewhere in southern Utah. We made pretty good time. Speed limit increases to 80mph once we get on the open straight away. Cooking along pretty good until we run in to construction where the speed drops down to about 60-65 mph. We stopped in the afternoon in St. George UT to get a cup of coffee and look at hotel possibilities. We found that bargains for hotels in Las Vegas depended on booking for a 3-4 day stay. No bargains for single night. Boo-hoo. So we decided to try Primm, NV. Last port of call before the CA-NV border. There are three large hotel-casinos there. First one had long lines then fire alarm went off. Nobody in the casino moved. Incredible. So we went to another casino in the area, all booked. huh? It’s monday night. Why are all these people going to a hotel-casino to get rid of there money? Continuing on would take us at least 50 miles into CA before we would get to a hotel. So we had to back track about 20 miles to the Gold Strike Hotel Casino. $39 per night and AAA discount of 5%. It’ll do. Not particularly fancy. Had dinner at the buffet for $20 for the two of us. Paula tried her luck at one of the slots. She lost $5 faster than you can blink your eye. No free wifi either. So tomorrow we have about 250 miles to San Pedro. It’ll be good to be home. Another hot and sunny day in SLC. 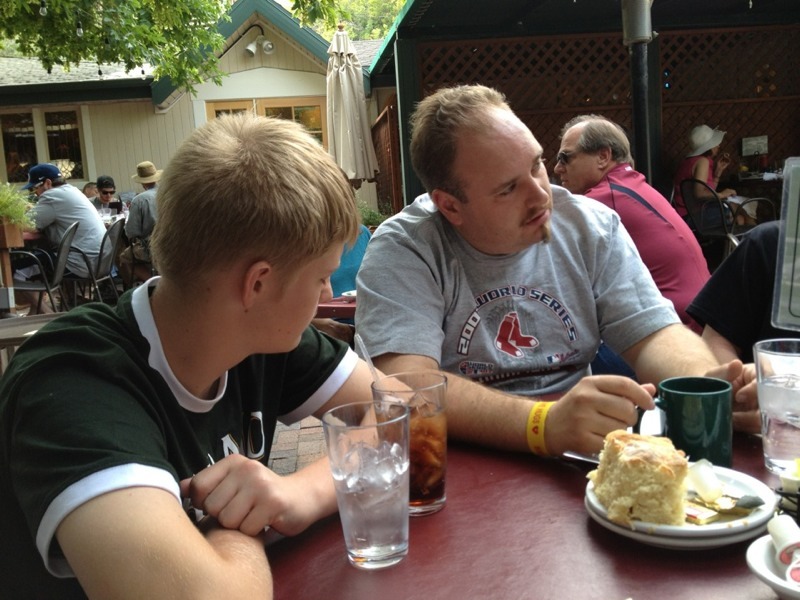 We met up with Neil, Dawn and the boys and headed off to a farmers’ market in downtown SLC. 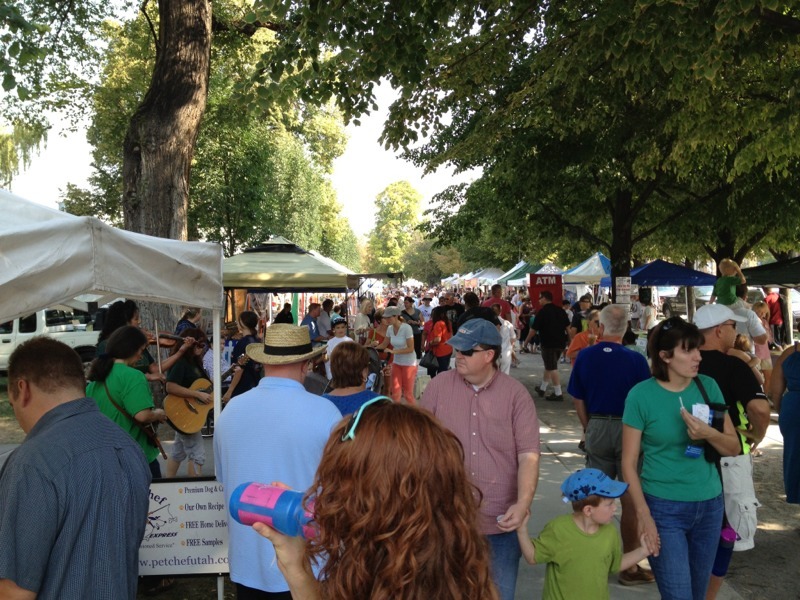 Lots of fresh produce and local artists and artisans were there. This is a really large farmers’ market. Once we finished with the market, we had lunch at a local sports bar. Quiet afternoon to catch up on stuff. Spaghetti and sausages for dinner. One more day in SLC tomorrow, then off to LA via Vegas. Friday we drove up to Park City with Neil and his family. First stop was the Tanger Outlets to shop for back to school stuff for the boys. I couldn’t believe that we’d driven over 4000 miles to go to a Tanger outlet. Just like Tilton, NH only bigger. 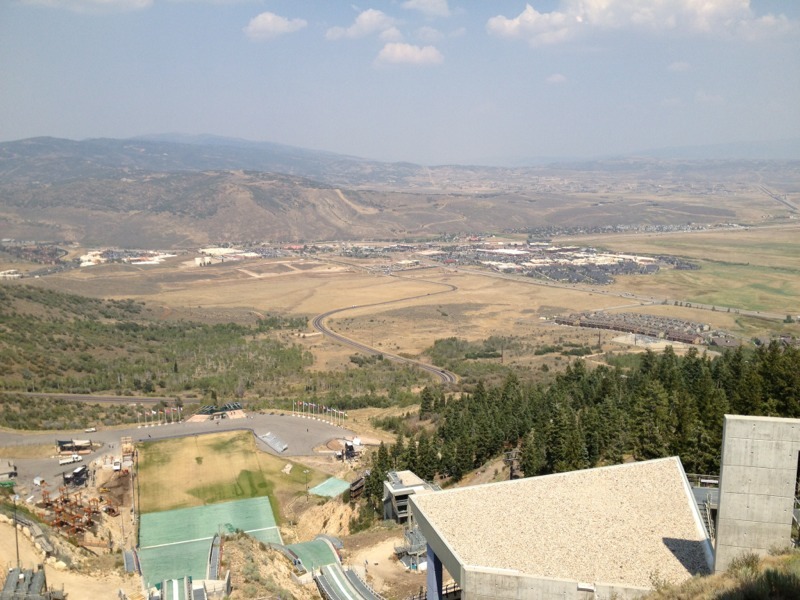 We had lunch at a Chinese restaurant in Park City then we went up to the Olympic Park. This was one of the sites for the 2002 Winter Olympics. 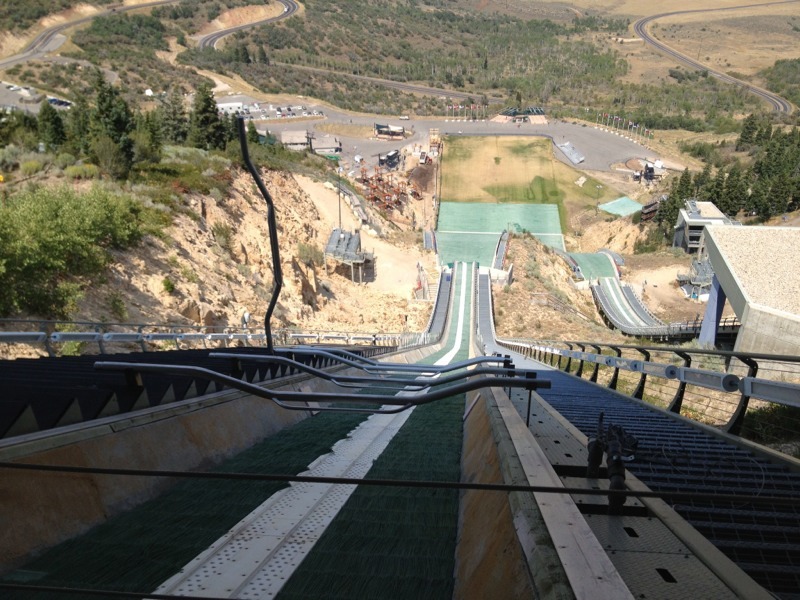 This was the site for all of the ski jumping events. 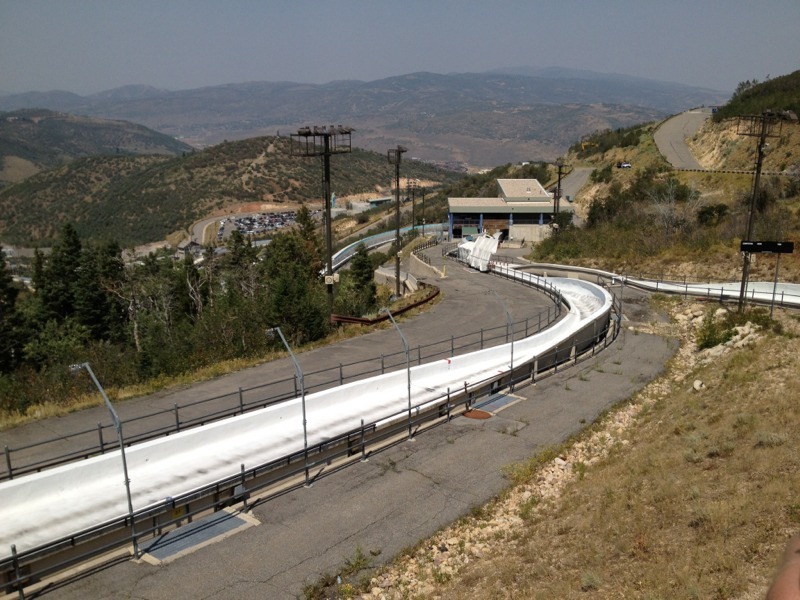 It is still in use for olympic training and world class ski jumping events. The boys did the zip line and adventure course. We did the tour that took us up to the top of the big ski jump. 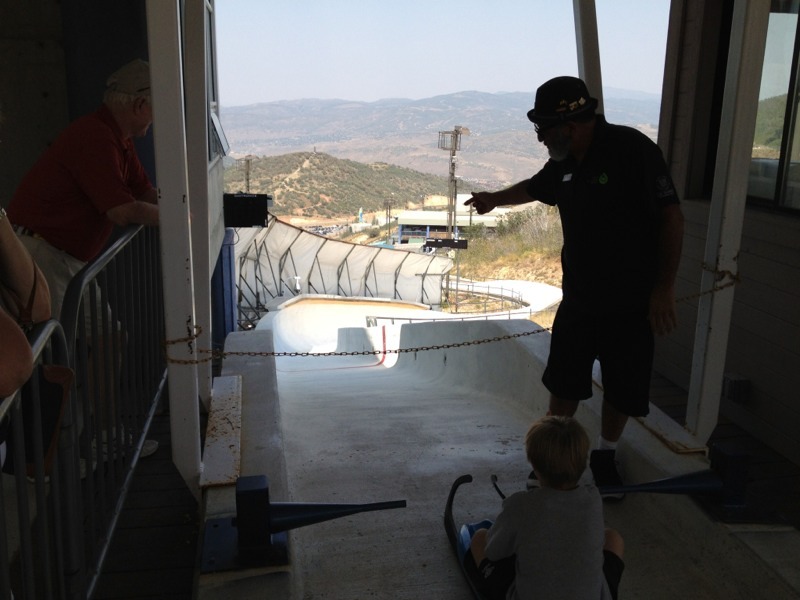 luge, and bobsled. Here are some of the pictures from the top. 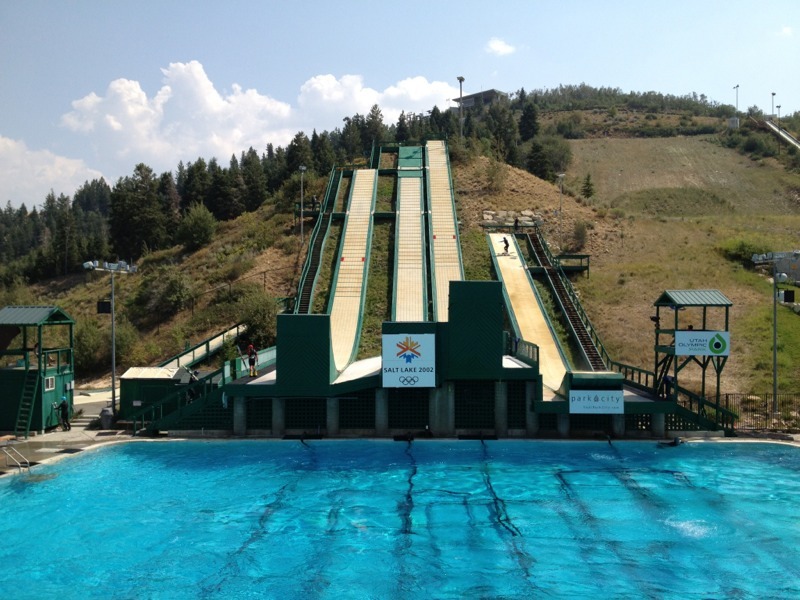 They also do training for ski jump and freestyle skiing even during the summer months. The tracks are like a giant slip’n’slide. They end up landing into the big pool. That way noone gets hurt. Saturday, we’re going to local farmers’ market. Weather here is going to be hot and dry. Forecast high of 98F. Pretty dry. Awoke to a steady rain in Salina. Good Lord they need it. I took a look at the weather map. Rain ending at western KS. Cleared up nicely. We got on the road a little bit later than usual. Just as well I didn’t particularly want to drive in the rain. We got onto I70 west. Cranked up the Jeep to 70mph and set the cruise control. Speed limit in KS is 75, but I’m not comfortable taking the Jeep to 75. Occasional construction lowered the speed limit to either 60 or 45. But it was 70mph almost all the way. In New England the speed limit never gets over 65. Out here on the open road 75 mph is pretty common. We did about 450 miles today, 3450 total. Gas price is still averaging around 3.50 per gallon of unleaded. Cheapest prices were in SC. I better get ready for the shock of gas prices in LA. I had hoped to be able to see the Rockies from Longmont. No luck, smog has visibility under a mile. Also, while driving up I25 just before we arrived at the hotel, we saw a truck with MA plates. Not very common. We had dinner at burrito fast food restaurant called La Qdoba Grille. They make burritos to order. I had hoped that we could find a hotel with restaurant with bar in walking distance. No such luck. We have 500 miles to get to West Jordan, UT. Our schedule says we should be there by Thursday. So that makes tomorrow an easy day.